While some of the best Cyber Monday game deals might be winding down, there's plenty of amazing stuff still in the hopper, including some really strong Cyber Monday TV deals. 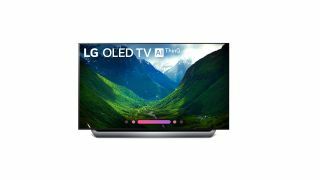 Whether you're looking for a gorgeous, gigantic 4K OLED or a smart LED on a budget, there are deals out there still burning bright. Even later in the day/week, the Black Friday and Cyber Monday blitz is one of the best times of the year to upgrade your set - manufacturers tend to push deep price cuts on top models ahead of the holidays. And if you want to find great prices on some consoles and games to play on your shiny new television, head over to our huge Cyber Monday PS4 deals and Cyber Monday Nintendo deals pages. Plenty of goodies left there, from bundles to games to accessories, to treat yourself or anyone on your gift list this holiday. If you're looking for a big 4K LED set with HDR support, you won't find a better deal than this Sharp TV. It's a no frills, 60Hz model that eschews extras and add-ons for value, and this is the best price we've seen on it thus far. Samsung's big 58" step-up 4K LED is a lovely, thin-bezel HDR panel, and getting any 4K TV this size for under $500 is a pretty sweet bargain. For sheer size, this massive Sony panel is tough to beat, with its 120Hz refresh and equipped with some nice Sony extras like 4K HDR Super Bit Mapping and X Reality Pro engine. The headline here, though, has to be the incredible $1,000 Cyber Monday discount.